Dette indlæg blev udgivet i About Somalia, Past og tagget Independence Day, National anthem, Siad Barre, Songs den 27. november 2011 af Nasrin Billie. Many Somalis view the 70’s as Somalia’s golden age. A period of prosperity, peace and happiness under the rule of Siad Barre. Here, the main objective was to build a nation after the model of the Soviet Union. The Somali Democratic Republic was the name that the communist regime of former President of Somalia, Major General Siad Barre gave to Somalia after a coup d’état in 1969. A profitable alliance with the Soviet Union helped the regime expand the state sector and build one of the largest armies in Africa. 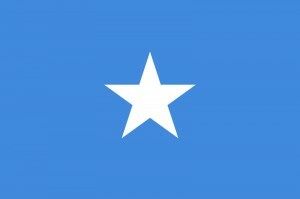 Somalia had achieved independence in June 26, 1960 due to the rise of the Somali Youth League – Somalia’s first political party. On July 1, 1960, Italian Somaliland united with British Somaliland to form the Somali Republic. These dates compromise the lyrics of a popular national song. In the 70’s, large-scale public works programs and literacy campaigns helped dramatically increase the literacy rate among Somalis across the nation. In addition to the nationalization of industry and land, the new regime’s foreign policy placed an emphasis on Somalia’s traditional and religious links with the Arab world, eventually joining the Arab League (AL) in 1974. Siad Barre managed to reconcile communism with religion by adapting Marxist ideology to local circumstances. Emphasis was placed on the Muslim principles of social progress, equality and justice. were completely in line with teachings of Islam. This enabled Siad Barre and his government to take the position as the country’s moral high ground. He named himself Jaalle Siyaad, “Comrad Siad”, forbade clanism and stressed loyalty to the central authorities. Many Somalis view the Siad Barre era as the most prosperous period in modern Somali history. Volunteer labour harvested and planted crops, and built roads and hospitals. Almost all industry, banks and businesses were nationalised, while cooperative farms were promoted. An entirely new writing script for the Somali language was introduced. Education in government schools had to be conducted in Somali, and in 1972, all government employees had to learn to read and write Somali within six months. To spread the new language and the methods and message of the Siad government, secondary schools were closed in 1974 and 25,000 students from fourteen to sixteen years of age and an additional 3,000 military and civil service employees were sent to rural areas to educate their nomadic relatives. Soundfile lyrics can be viewed here. Dette indlæg blev udgivet i About Somalia, Past og tagget Communism, Independence Day, Nationalism, Siad Barre, Socialism, Somali language den 26. november 2011 af Nasrin Billie.